In June 2011, Ken Armstrong watched a YouTube video that would change the course of his life. The video was created by urban farmer Will Allen, founder of the sustainable agriculture nonprofit Growing Power, Inc. and avid proponent of aquaponic farming. A year later, in June 2012, Armstrong would break ground on his own aquaponic operation, Ouroboros Farms. Armstrong and his business partner Kenji Snow started Ouroboros with a strong desire to join the future of farming. “We wanted to be innovators and a model for a new integrated, living ecosystem methodology of farming that partners with nature, rather than trying to overcome it,” said Armstrong. With an underlying mission of environmental sustainability, Armstrong and Snow enthusiastically embraced aquaponics (which uses 90% less water than a typical soil farm) along with various other sustainable practices. Specific practices utilized by Ouroboros include harvesting rainwater, composting all unsold material using batch composting and vermicomposting, and the creation of a beneficial insect hedge to avoid pesticide use. Armstrong is extremely passionate about the potential of aquaponics, emphasizing the many unique benefits of aquaponic systems. Aquaponic systems, for example, have no weeds, which eliminates the need for herbicides. The aquaponic system also provides plants with a constant stream of water and nutrients, which allows them to grow faster, more compactly, and more efficiently. Moreover, the fish in aquaponic systems are extremely sensitive, which necessitates that farmers follow even stricter standards than organically certified operations. 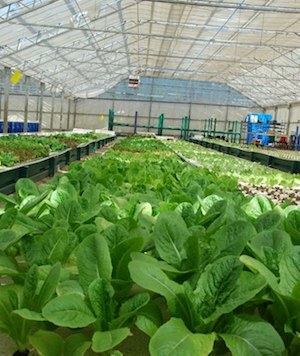 Ouroboros Farms has found the aquaponic system efficiently meets the needs of their clientele. Currently, Ouroboros sells its produce at farmer’s markets and direct to chef’s, but they are actively working to expand their distribution and are pursuing corporate accounts. “Aquaponics is well suited to custom growing, so our business model includes custom growing for chefs and restaurants, providing them with unique varieties as well as out of season items which we can grow in our greenhouse,” said Armstrong. The crop selection at Ouroboros Farms is various and plentiful, although they place a special emphasis on the bread and butter of aquaponic farming, leafy greens. Presently, the farm grows ten different lettuce varieties, five different basil varieties, and four different tomato varieties. In addition, the farm grows sage, parsley, oregano, thyme, peppers, okra, watercress, chard, dino kale, ripbor kale, red russian kale, celery, watermelons, bok choy, tatsoi, cucumbers, squash, peas, radishes, carrots, beets, sorrel, dandelion greens, and mustard greens. To complete the aquaponic system, Ouroboros also raises four types of fish: carp, catfish, bluegill, and trout. As a very young company, Ouroboros Farms is still perfecting its business model. Initially, Armstrong and Snow invested a lot of time and money into setting up their aquaponic operation: a total of $25,000 spent on materials and 1,200 man-hours in its construction. Armstrong emphasizes, though, that future expansion would be much less costly and time consuming. “We have learned, much through experience, about how to more efficiently build a system,” said Armstrong. Its incipience and the process of trial and error also mean that Ouroboros Farms hasn’t quite reached its target of profitability yet. “Projections put profitability likely in the spring of next year, at around the 2 year mark,” said Armstrong. Armstrong remains enthusiastic and optimistic about the future of Ouroboros and its role in the evolution of farming. From a logistical standpoint, Armstrong hopes to see Ouroboros expand from 18,000 square feet to 100,000 square feet in the next five years. From an ideological standpoint, his goals for the farm are much broader and all-encompassing. “We would like to take our knowledge and expertise to help communities build systems in areas where high quality produce is hard to come by such as food deserts here in the US, as well as in areas of the third world where resources are scarce,” said Armstrong.